Use one bubble ball in your bath and you will be amazed at the bubbles it creates. Relax and enjoy a luxurious bubble bath! NOTE: If you are making these products for sale, good manufacturing practices recommend you wear a hairnet, gloves and a mask. We also recommend a clean apron and workspace. Lathanol LAL Powder is a very airborne product. You will need a mask and a contained space when making your finished product. To large mixing bowl, add Baking Soda, Lathanol Powder and Bubble Bar Hardener. Gently mix with a wire whisk to incorporate all ingredients. We recommend wearing a mask during this step as the powder is very fine and can be easily inhaled. Add 9.5 ml Waterlily & Bluebell Fragrance Oil to the dry mix and carefully mix together. Add Bubble Wash Pearlizer and Bubble Up slowly while kneading ingredients together. The mixture will begin to take on the consistency of dough. When adding the glycerin, start with 2.5 oz. and add a little more at a time (if necessary) until mixture takes on a doughy consistency. When the dough begins to hold together in your hand, gather dough into one large ball and place on a scale to weigh. The batch should weigh approximately 25 oz. Divide the dough into (2) 12.5 oz. batches and place in separate bowls. To one bowl add 6 drops of Ocean Blue Liquid Color. With gloved hands, mix together well until the color is completely blended in. If a darker shade is desired, add more color 1 drop at a time. To the second bowl, add 4 drops of Santa Red Liquid Color. Again, using gloved hands mix well to incorporate the liquid dye.If a darker shade is desired, add more color 1 drop at a time. Mix 4 oz. of Epsom Salts and 1/2 tsp. Iridescent Super Sparkle Glitter and put in a separate bowl. Scoop out a small amount of the blue color mixture and roll into a 0.50 oz. ball. Continue to make 0.50 oz. marbles with the rest of the mixture. Once the blue color is finished, continue with the pink color until all the bubble marbles have been made. Immediately roll marbles in the mixture of Epsom Salts and Iridescent Super Sparkle Glitter. You may need to gently press the salts into the ball so they stick. Place bubble marbles on a jelly roll pan covered with wax paper. Let set overnight to harden. Package 5 bubble marbles in a 4 oz. heavy wall jar with a white dome top. 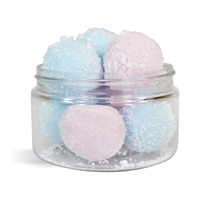 TO USE: Place one bubble marble under running water to dissolve and create a tub full of bubbles. Ingredient Label: Sodium Bicarbonate, Sodium Lauryl Sulfoacetate, Glycerin, Potassium Bitartrate, Cocamidopropyl Betaine, Sodium Laureth Sulfate (and) Glycol Distearate (and) Cocamide MEA (and) Laureth-10, Fragrance, Red 33, Red 40, Blue 1. 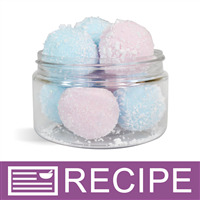 "I would like to make this recipe with a different fragrance and double the amount. Would I just double the recipe? Also is one marble enough for a tub full of bubbles or would two be better? 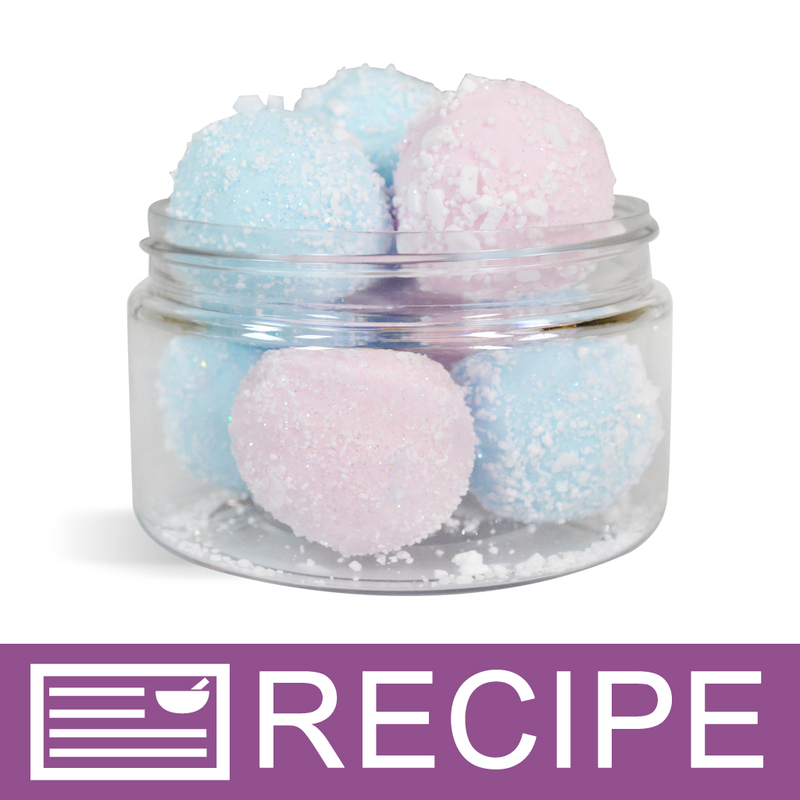 Thank you, Lynda"
Staff Answer You can remake this recipe with any fragrance you like. You should be able to double the entire recipe but always test your results as the recipe was designed to make 45 bubble balls. "Could you substitute SCI instead of SLSa?" Staff Answer We have not tried Sodium Cocoyl Isethionate (SCI) in this recipe but you can certainly give it a try. Please let us know how it works for you! "Can I sub a butter or viscous oil such as castor for the glycerin? Will it still bubble? Thank you!" Staff Answer The glycerin was used to help keep these marbles on the softer side and make them moisturizing to the skin. You would need to test any substitutions in this recipe. We cannot say how these substitutions would affect this recipe. "But SLS is in the bubble wash paerlizer, can this be omitted or substituted?" Staff Answer We do not recommend altering the recipe in that way. "what is the scientific name for the bubble up? I have to keep a MSDS on all items used. " Staff Answer It is Cocamidopropyl Betaine. "Can I use a powdered color instead of liquid with this recipe?" Staff Answer Yes! Just be very careful to not over color the product. You don't want any staining. "Can this recipe be made without the SLS in it. I don't use that in my products but would like an alternative that makes nice bubbles." This recipe calls for SLSa which is not the same as SLS. SLSa Sodium Lauryl Sulfoacetate will produce the bubbles you want. SLSA is a large molecule product generally considered gentle and non irritating as the larger molecule doesn't penetrate the skin. "Hi there I was just looking at your new bubble marbles recipe and I'm excited to try it! I do not have the bubble up or pearlizer products and don't really want to buy those specifically for this product. Is there something else I can substitute,(I have limited supplies available right now) or better yet can I just leave it out and increase one of the other liquid ingredients? Thank you so much Nickie"
Staff Answer Both of these ingredients are essential to the recipe. You will not get a good performance by increasing the other liquids and leaving these two out.